WATCH: Bryce Harper Booed Loudly in Return to D.C. Many wondered what type of reception new Phillies slugger Bryce Harper would receive, in his return to Nationals Park to face his old team. The cities of Philadelphia and Washington, D.C., share a lot of history. 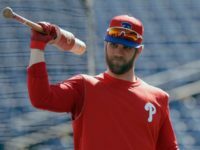 After all, Philadelphia was our nation’s capital before the government eventually moved to D.C.
NEW YORK (AP) — Bryce Harper and the Philadelphia Phillies have agreed to a $330 million, 13-year contract, the largest deal in baseball history, a person familiar with the negotiations told The Associated Press. D.C. area residents are more impacted than most, when it comes to the affects of dealing with the partial government shutdown. 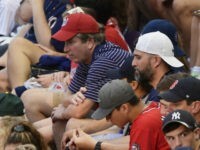 However, one D.C. sports team is taking action when it comes to accommodating fans who may have had to tighten their belts. 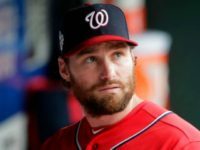 A member of the billionaire family that owns the Chicago Cubs admitted that they considered taking a pass on a trade for second baseman Daniel Murphy because of of the player’s Christian views about homosexuality. 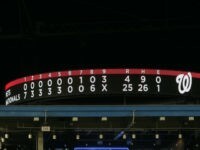 The left-wing ProPublica took to Twitter to solicit the public’s help in uncovering SCOTUS nominee Brett Kavanaugh’s baseball buddies. WASHINGTON (AP) — The New York Mets have been searching for any reason to smile during a miserable season. This laugher wasn’t exactly what they had in mind. 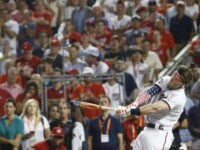 WASHINGTON (AP) — Bryce Harper thrilled the home crowd and surely made his father proud, winning the All-Star Home Run Derby on Monday night with an exceptional display of power that carried him past Kyle Schwarber of the Chicago Cubs 19-18. 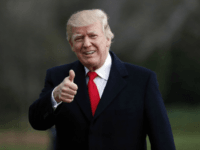 President Donald Trump is likely to skip the All-Star Game at Nationals Park in Washington DC on Tuesday, according to reports. 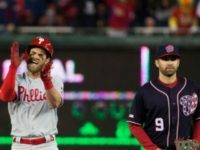 As a healthy Freddie Freeman renews excitement of the fans of the NL East-leading Atlanta Braves, the Washington Nationals still have even more talent and the Philadelphia Phillies improved dramatically. WASHINGTON (AP) — Veteran Washington Nationals infielder-outfielder Howie Kendrick tore his right Achilles tendon in the opener of Saturday’s doubleheader against the Los Angeles Dodgers and will miss the rest of the season. 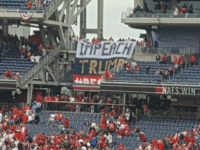 Two sports writers for the Washington Post slammed President Donald Trump for skipping the Washington Nationals’ opening day but also attacked him for using sports to divide America. The pair ultimately decided that Trump is too divisive to be allowed to participate in national sports. 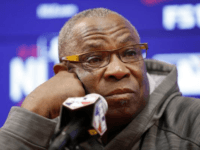 Washington (AFP) -The Washington Nationals parted company with manager Dusty Baker on Friday in the wake of the team’s latest playoff near-miss. 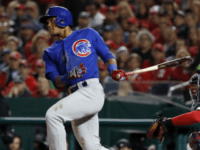 WASHINGTON (AP) — Addison Russell drove in four runs, Wade Davis earned a seven-out save, and the Chicago Cubs reached their third NL Championship Series in a row by edging the Washington Nationals 9-8 in a thriller of a Game 5. 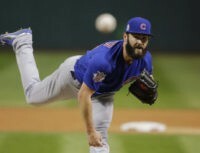 CHICAGO — Game 4 of the NL Division Series was postponed by rain on Tuesday, giving Chicago Cubs pitcher Jake Arrieta another day to rest his troublesome right hamstring and putting ace Stephen Strasburg in play for the Washington Nationals. 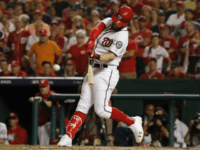 WASHINGTON — Things were looking bleak for the Washington Nationals and their dormant offense until Bryce Harper and Ryan Zimmerman took over. 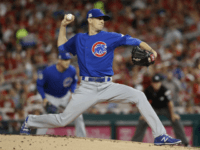 Kyle Hendricks goes about things completely differently than Stephen Strasburg does on the mound. The kid from Dartmouth relies on a fastball that on a good day reaches 88 mph — about 10 mph slower than Strasburg’s — and a deceptive changeup. Instead of power, he gets by on precision, guile and smarts. The defending World Champion Chicago Cubs are in town to play the Nationals this week, and when in DC, you do the kinds of things that DC people do. You go to the White House. Jake and Patrick Killebrew of Richmond, Virginia have a routine. When the Nationals play, they watch. The Nationals also have a routine, when they put in their bullpen, they lose. 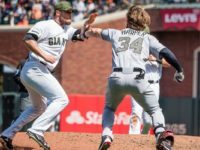 Not everyone thought that the brawl between the Nationals and the Giants, headlined by outfielder Bryce Harper and reliever Hunter Strickland, was necessarily a great look for major league baseball. 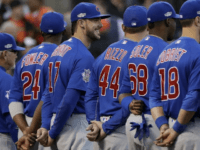 But, don’t count Cubs pitcher Jake Arrieta among them. 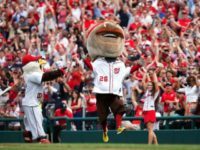 President Donald Trump declined the Washington Nationals invitation to throw out the first pitch on Opening Day. Given the message some protesters had waiting for him at the game, perhaps now we know why. 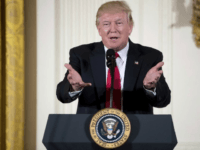 President Donald Trump declined an offer from the Washington Nationals to throw out the first pitch on Opening Day. Previous presidents, such as Barack Obama and George W. Bush, had accepted the invites when offered. 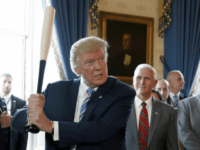 Early on Tuesday rumors began circulating that President Donald Trump was in talks with the Washington Nationals to throw out the first pitch on Opening Day this month. But, it appears the White House has decided to turn down the invitation. 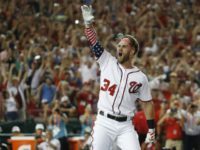 A sports columnist for the Washington Post lit into recently released Washington Nationals pitcher Jonathan Paplebon saying that because he supports Donald Trump and the Second Amendment he doesn’t reflect the interests of local fans. 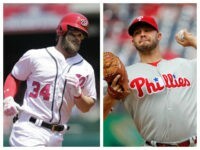 Bryce Harper of the Washington Nationals has signed the largest endorsement deal in Major League Baseball history. Senate Majority Leader Mitch McConnell weighed in on the Washington Nationals’ disappointing 2015 season at a Monday Politico breakfast. 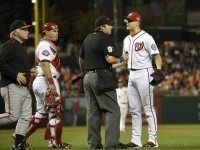 Closer Jonathan Papelbon has filed a grievance against the Washington Nationals for using the team-imposed four-game suspension at the end of the 2015 season as an excuse to cut his pay. 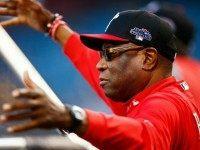 WASHINGTON (AP) — Dusty Baker is the new manager of the Washington Nationals, meaning Major League Baseball avoids what would have been its first season since 1988 with zero black skippers. Three teams picked new managers on Thursday. 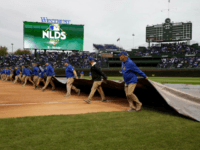 The Washington Nationals selected former San Diego manager Bud Black as skipper, Miami chose Don Mattingly to manage the Marlins, and the Padres picked Arizona Diamondbacks third base coach Andy Green to lead their team.